Britain's decision to leave the European Union prompted Prime Minister David Cameron to resign and markets to fall around the world. Final results in Thursday's historic referendum gave the "Leave" campaign 52 percent, while "Remain" took 48 percent. Voter turnout was reported high across Britain, even with heavy rain falling in many areas. The outcome shocked many within Britain and across the world since recent opinion polls showed a growing lead for "Remain." UK Independent Party Leader Nigel Farage was the most vocal voice in the anti-EU movement. He said the "Leave" win was "our independence day." He called the results "a victory for real people, a victory for ordinary people, a victory for decent people." The close vote showed how deeply divided Britons are on issues of immigration and sovereignty that became the focus of the "Leave" campaign. Cameron: Britain needs "fresh leadership"
Prime Minister Cameron addressed that divide outside the official residence at 10 Downing Street Friday morning. "The British people have made a very clear decision to take a different path, and as such, I think the country requires fresh leadership to take it in this direction." 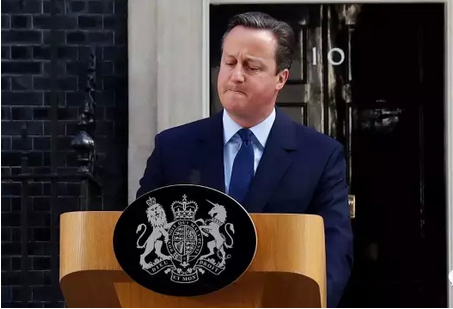 The Conservative Party prime minister said he planned to leave office by October. Cameron campaigned for continued EU membership. He said an exit would lead to disastrous consequences for Britain's economy and national security. The "Leave" campaign focused on what it views as uncontrolled immigration to Britain. It argued that Britain cannot effectively regulate the number of immigrants because of current EU rules. The movement believes the Brussels-based EU imposes too many regulations in Britain. It also argued that EU leaders are not accountable to the British government or its citizens. British media reported the leading contender to replace Cameron is former London mayor Boris Johnson. He is a Conservative member who served as leader of the "Leave" campaign. On Friday, Johnson complimented Cameron for showing "bravery" for calling the referendum. "I think that the electorate have searched in their hearts and answered as honestly as they can." He added: "This does not mean the United Kingdom will be any way less united (or) any less European. We cannot turn our backs on Europe, we are part of Europe." Top EU leaders said in a statement that Britain will officially remain a member until its exit negotiations are completed, probably in about two years. Britain's European neighbors also expressed regret at the results and some called for changes in the EU to prevent other countries from leaving. German Chancellor Angela Merkel warned Europe not to draw any "quick and simple conclusions" that might create more division. French President Francois Hollande said, "To move forward, Europe cannot act as before." In Italy, Foreign Minister Paolo Gentiloni said Britain's decision should be seen as a "wakeup" call to the rest of the EU. Analysts say the decision to quit the EU after four decades means Britain faces many uncertainties and will have to start building new trade relationships with the rest of Europe. The British vote caused turmoil in financial markets around the world. Stocks went down in Europe, Asia and the United States. The British pound also fell to its lowest level since 1985. Bank of England Governor Mark Carney said there would be "a period of uncertainty and adjustment" after the result. But he added that Britain had planned for the possibility and is "well prepared." He said there would not be any immediate change in the way people travel or how goods and services can be sold. In other EU countries, political parties that favor immigration restrictions were quick to congratulate Britain. Many also called for holding similar referendums in their own countries. The leader of France's far-right National Front party, Marine Le Pen, called the vote a victory for liberty. She said she believes a similar referendum in France is a "democratic necessity." Le Pen also said she plans to meet with other pro-independence movements in the European Parliament soon to discuss their next moves after Britain's decision. Dutch anti-immigration leader Geert Wilders called for a referendum on EU membership in the Netherlands. Wilders is currently leading in opinion polls in the race for prime minister to be held next March. "It is time for a new start, relying on our own strength and sovereignty. Also in the Netherlands," he said. The leader of Italy's anti-immigration Northern League tweeted: "Hurrah for the courage of free citizens! Heart, brain and pride defeated lies, threats and blackmail." In Germany, Beatrix von Storch of Germany's rightwing populist party AfD, praised "Independence Day for Great Britain." She said the EU "has failed as a political union." They told me Mr.Smith would leave office in one month. The heavy rain delayed our journey. She has well prepared for the test. The policy wasn't meant to hurt the intersts of the ordinary people. 1.He said an exit would lead to disastrous consequences for Britain's economy and national security. Inadequate examination of any of these may lead to error. 2.The "Leave" campaign focused on what it views as uncontrolled immigration to Britain. Whoever ran it was supposed to view the airport as a whole. Nowadays, business and information technology can be viewed as two cogs of the same wheel.